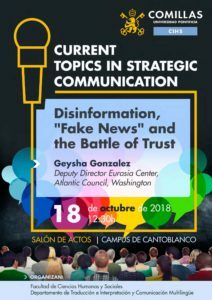 Geysha Gonzalez, Deputy Director of the Atlantic Council’s Eurasia Center and founder of DisinfoPortal.org opened our new Current Topics in Strategic Communication series with an inspiring lecture on Disinformation and “Fake News”. In her talk, she explained the difference between disinformation, misinformation and propaganda, and shed light on some complex and controversial issues such as the Russian interference in the 2016 US presidential election or the politicization of the expresion “fake news”, which she prefers to refer to as “false news”. 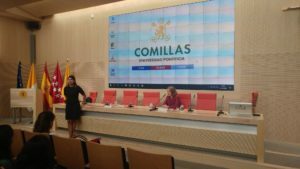 Ms Gonzalez answered numerous questions, stimulated debate and kept her large audience engaged and galvanized for more than two hours. She conveyed a very clear message to our students: in order to prevent the spread of misinformation we must be critical, double-check facts and sources and not share any “fishy” or questionable information on social media.